Arvada's story began with Colorado's first gold discovery. On June 22, 1850, a wagon train bound for California crossed the Platte River just north of the confluence with Clear Creek, following Clear Creek west for six miles. The members of the wagon train rested for a day, and Lewis Ralston dipped his gold pan in an unnamed mountain stream. He found almost $5 in gold in his first pan. John Lowery Brown, who kept a diary of the party's journey from Georgia to California, wrote on that day: "Lay bye. Gold found." In a notation above the entry, he wrote, "We called this Ralston's Creek because a man of that name found gold here." Ralston continued on to California, but returned to 'Ralston's Creek' with the Green Russell party eight years later. Members of this party founded Auraria (later Denver City) in 1858 and touched off the gold rush to the Rockies. Over the next century and a half, the significance of the discovery was lost. Eventually the entire area became blighted. And the State recognized the first gold find as being at the confluence of Little Dry Creek and the South Platte River in 1858 by William Greenberry Russell. Astute research by Lois Lindstrom, a local historian, proved that Arvada was the site of the first gold discovery. Ms. Lindstrom began her research in 1971 and sought Colorado State designation for Arvada in 1992. That attempt was unsuccessful because Lindstrom could not pin down the exact location of the gold discovery. Later on, she found a 1937 aerial photograph showing a grove of cottonwood trees at the confluence of Ralston and Clear Creeks which had since been removed for construction of a mobile home park. A member of Ralston's party had written about just such a grove. 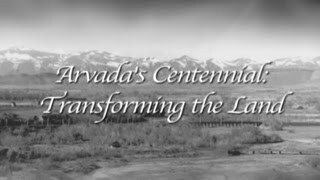 On December 1, 1995, the Colorado Historical Society officially recognized that Colorado's first discovery occurred in present-day Arvada. Today, land has been set aside for the development of Gold Strike Park at the confluence of Ralston and Clear Creeks celebrating Colorado's first gold discovery. A spectacular pedestrian bridge connecting the Ralston and Clear Creek trail systems was completed in October of 2001 and is a signature architectural gateway on Arvada's eastern edge. The 400-foot long curved bridge is supported by suspended cables and anchored by a three-foot diameter mast 100 feet tall.